The nights – The city is at its absolute magical and romantic best at night. 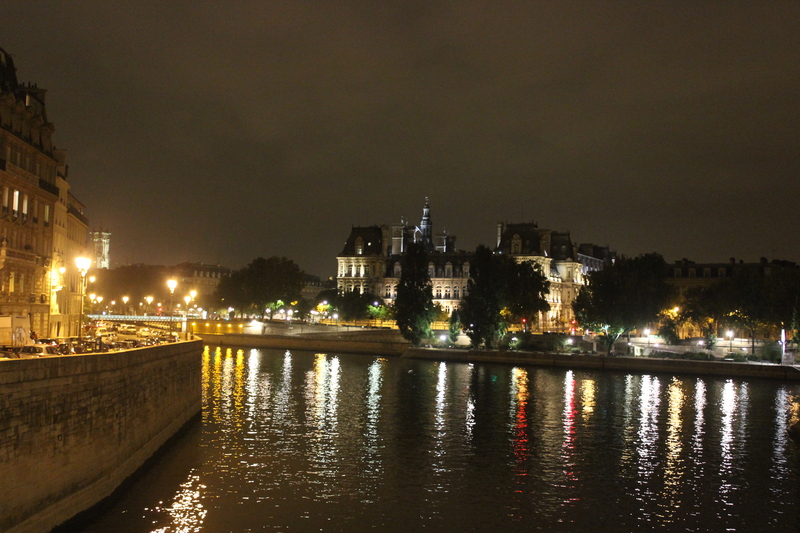 With the lights illuminating the buildings, monuments and the Seine, Paris by night is spectacularly beautiful. My husband and I would find a restaurant each night, where we would enjoy a magnificent. 3-hour dinner with a bottle of wine (we never had a bad meal) and then walk back to our apartment hand-in-hand, completely mesmerized with the city and each other. It was as if we were under Paris’s spell. 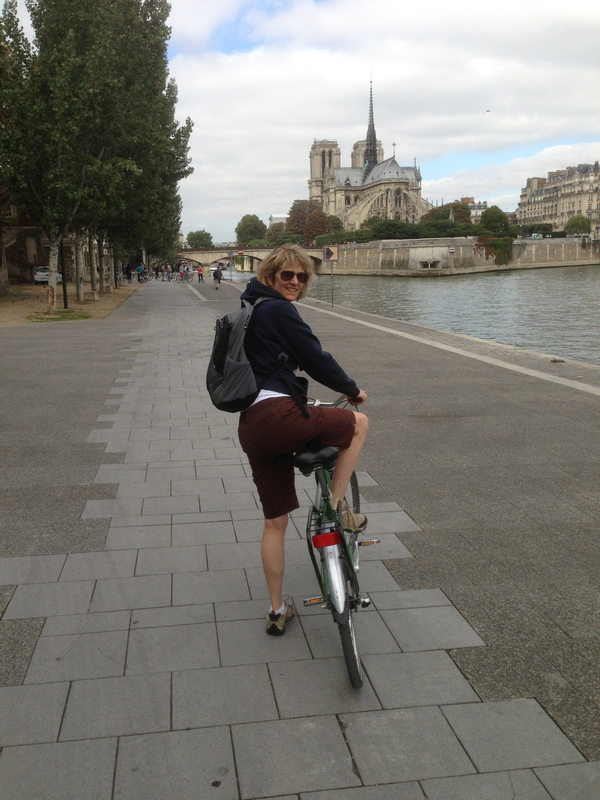 Bike riding – We went on two bike tours in Paris. One was a day tour with Bike About Tours and the other a night tour with Fat Tire Bike Tours. Both cater to English-speaking tourists and provide young spunky guides to steer their charges through the perils of Paris boulevards and provide some commentary along the way. We were at first skeptical of the wisdom of taking on Paris by bike, but the tours came highly recommended so we decided to chance it…and loved it! We found biking an easier and faster way to cover more ground than walking. For our day tour, we rode all over the city with a lovely young Swedish guide named Angelica. She gave us historical commentary as well as her personal perspective as a young student immigrant to Paris. For our night tour, we had a young burly German-American guide named Nick who was in Paris working on a master’s degree in information technology. His main goal was to keep us all alive. I have never been more terrified (and more euphoric) than on our ride down Boulevard St Germaine at night in heavy traffic. Nick’s often-repeated survival strategy was for us to all stay together in a block and when faced with oncoming traffic use “The Power of the Palm” (i.e., holding the hand in a bold gesture toward the oncoming vehicle.) My gratitude at outliving that stretch turned to wonderment when we crossed the Seine and biked into the courtyard of the Louvre. I was overcome with emotion at the beauty of the scene. I remember thinking to myself “I can’t friggin’ believe that I am actually here at the Louvre… at night…on a bike!” It was beyond cool. Seine River cruise – I signed us up for the evening of the first full day we were in Paris, thinking it would be a nice introduction to the city. But we couldn’t find the boat launch and it was one frustrating experience walking around the docks dressed up trying to find the right spot and not able to ask for directions (see my previous post about my issues with French). Later in the week, after I read the instructions more carefully and realized we actually walked right by the launch twice, we did the cruise on what proved to be a much better, clearer night. We saw a dramatic sunset onboard during dinner, and then the lights of the city. The waiter was kind enough to move us to a window seat. And by this time, having spent a little time walking around the city, it was enjoyable to see familiar sights from the water. Musee D’Orsay – This was by far my favorite museum. It is housed in a former train station, which itself is stunning. The D’Orsay holds mainly French art dating from 1848 to 1915, including paintings, sculptures, furniture, and photography. 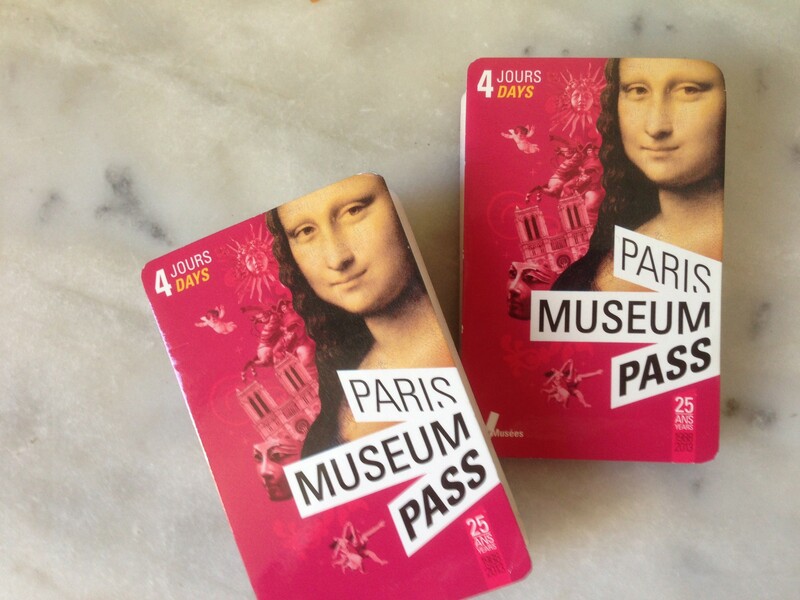 It houses the largest collection of impressionist and post-impressionist masterpieces in the world, by painters including Monet, Manet, Degas, Renoir, Cezanne, Gauguin and Van Gogh. It was also where the seemingly meek museum security guard suddenly shouted “Madame!” at me from across the lobby when I took an unauthorized photo (I couldn’t help myself). My second favorite museum was the Musee de l’Orangerie, which contains the famous water lilies paintings by Monet. This was a quick 20-minute stop but one of the most unforgettable. Luxembourg Gardens – I’ve been to several famous parks and gardens in the U.S., including New York’s Central Park, but I have never seen anything like Luxembourg Gardens. The flowers! The lake! The fountains! We strolled through during the middle of a weekday afternoon and it was bustling with Parisians soaking up sun, children on the playground, tennis matches and bocce ball games in progress. It was an explosion of color and beauty and activity. I later read that the French equivalent CIA has it headquarters under the park, which only added to its appeal. Waiting at the “Midnight in Paris” stairs for the Magic Cab to pick me up! 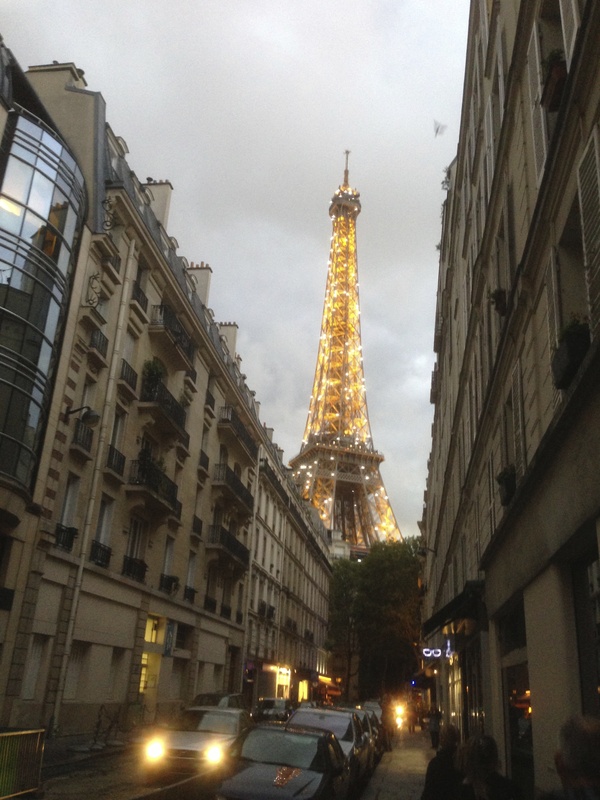 Walking – We loved exploring the neighborhoods of Paris. 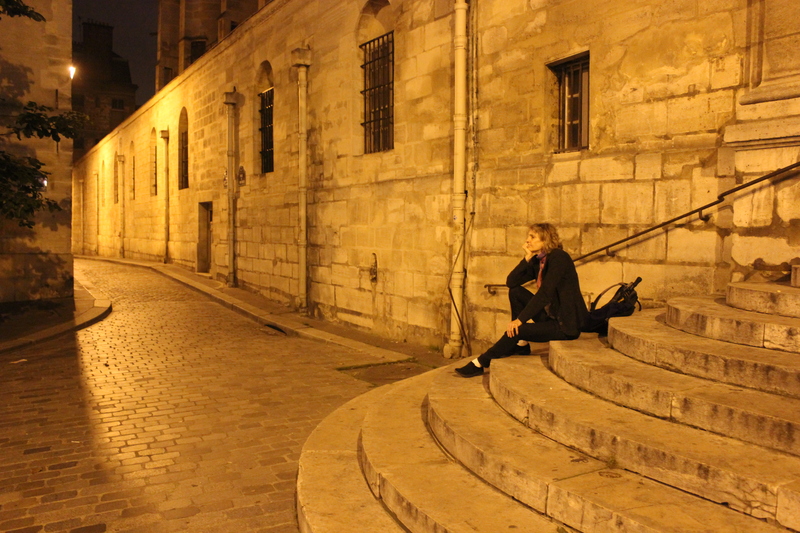 One day on a whim we did a “Midnight in Paris” treasure hunt. We re-watched the Woody Allen movie before we left home and decided to find the scene locations. We found a self-tour someone had posted on-line and set off on our quest. We found two of Hemingway’s apartments, Gertrude Stein’s salon, homes of Cole Porter and Ezra Pound, and the famous “stairs,” where the character played by Owen Wilson stops and rests after getting lost in Paris one evening. Around the corner comes a vintage 1920s cab, which picks him up and transports him back in time, where he meets Hemingway, Porter, Stein and others. The actual stairs used in the movie are at the Church of St Etienne du Mont near the Pantheon. We also did a self-tour of the Montmartre area, and found an eclectic mix of sites including Picasso’s studio, Renoir’s apartment, Van Gogh’s house, the café from the French film Amelie and the last remaining vineyard in Paris. 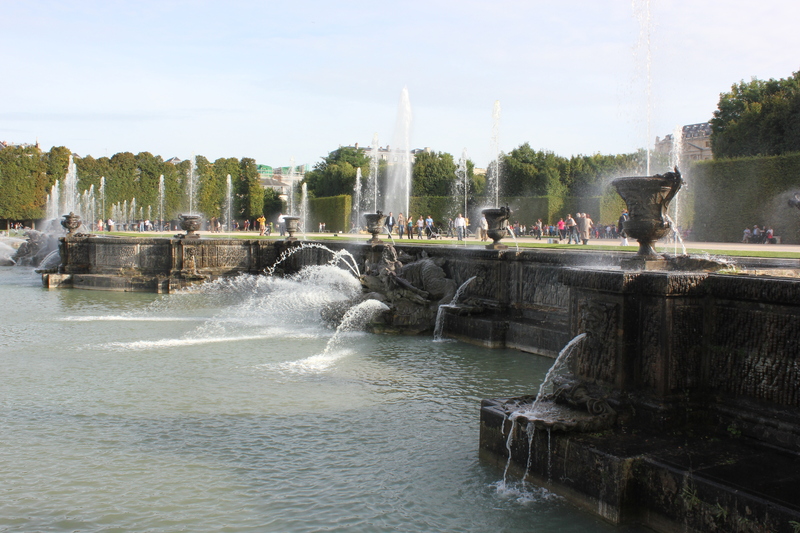 The Gardens of Versailles – I didn’t care much for the Chateau (palace) of the Louis’ (XIV – XVI). It was definitely worth seeing — beautiful in an ostentatious, over-the-top sort of way. But the crowds were horrific and I was happy to be spilled out the back door to what I found most spectacular and memorable about the visit – the gardens. It was a stunningly gorgeous day and we were fortunate to visit on a day when the water fountains were flowing. The last thing we saw before leaving was a 15-minute water display at the “Jupiter Fountain” made up of at least 40 individual fountains. It was not high-tech, with lights or lasers or gadgetry, but rather a lovely and graceful water display on a beautiful day with period music playing in the background. At the conclusion, I noticed a young worker who carried what proved to be an enormous ancient metal sprinkler key (not unlike a gigantic version of ours before we installed automatic timers) open a cap in the pavement, turn a valve with the key, and off went the water! Just as they’ve been doing since the 1790s no doubt. Normandy and Giverny – We took two side-trips, one to Normandy to tour the D-day Beaches and Mont St Michel, and the other to Giverny to see Monet’s house and garden. 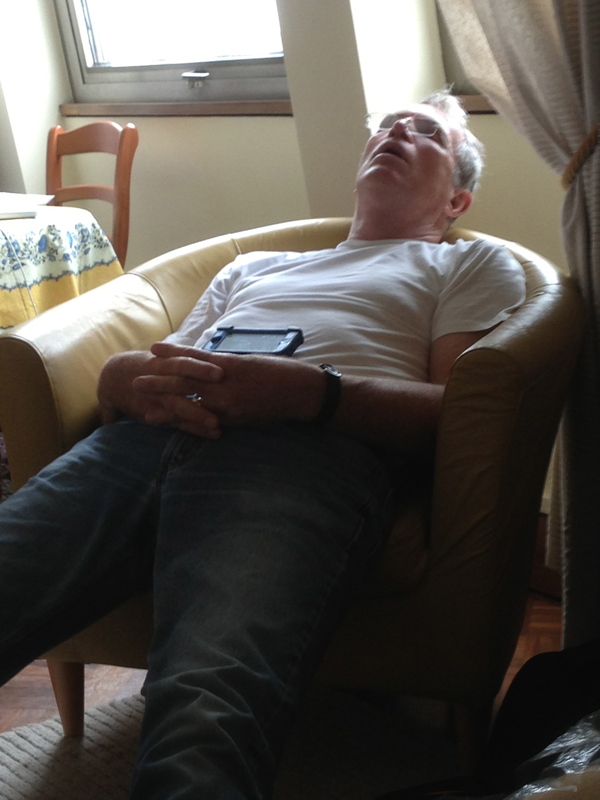 Both were highlights of the trip and warrant posts of their own to describe. My first night-time view of the Eiffel Tower, doing its sparkle show! Eiffel Tower – Even though I’d seen a zillion pictures my entire life, the Eiffel Tower in person is still hands down the most spectacular sight in Paris. I’d already been to Epcot Center and Paris Las Vegas Hotel and Casinso (with its scale model of the Tower) so I thought I’d already pretty much seen it. But the sight of the real thing in person at night takes your breath away. The night of our ill-fated dinner cruise (when we couldn’t find the launch spot) we instead went to dinner at a restaurant nearby. As we rounded a corner, I caught my first sight of the Eiffel Tower all lit up. Not only that…every hour on the hour for five minutes there is a sparkly light display on the Tower……and that was my first view. I immediately burst into tears at the sight. I realized that, even though we missed our dinner cruise and I was initially terribly disappointed, in this city there are countless other splendors just waiting around the corner.